THE SEWING ROOM ORGANIZATION CHALLENGE BEGINS NOW! 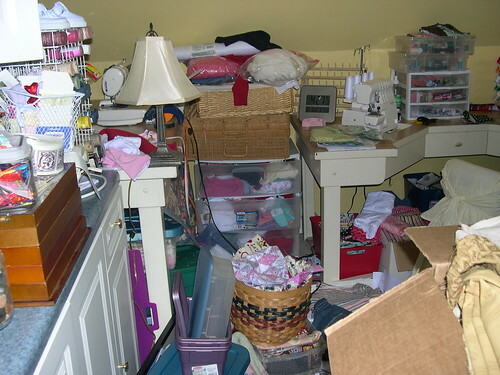 It’s that time again…time to clean out the clutter in our sewing rooms and get them ORGANIZED! Over the last few months, many of us have been trying to get our sewing spaces in order. For many of us, this is our biggest challenge. We are breaking it up into manageable tasks, so we can finally find lost fabric and have room to create. 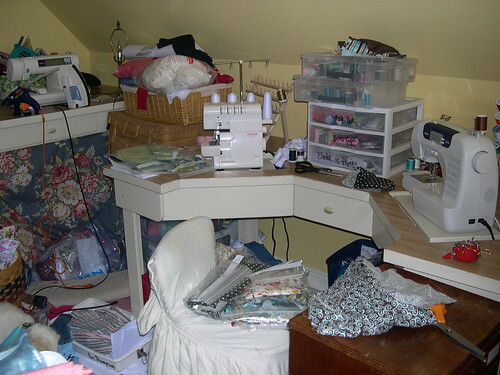 Many of us are simply embarrassed by the mess in our sewing spaces….so find a “sewing buddy” to privately share your shame if you are not brave enough to post here…but then you don’t get a prize. Our first task will be to clear off our cutting table or main work area. By doing this, you will have a large surface to sort your fabrics and various sewing notions. My current cutting table is a medium-sized conference table (measures 36” by 72”) which holds 3 large cutting mats. Ideally, your cutting table should be placed in the center of the room where you can walk around it and cut from any angle. I also have my cutting table on adjustable bed risers so it helps my back. Recently I purchased several industrial cutting tables, but won’t be setting them up until after the home renovation. So for the time being, my good old conference table will have to do. Next up will be the 1st Challenge (Fabric Organization)…so be sure to check back! Now let’s see those pics! oh i need this.. thank you! my sewing/craft room is just awful! i think i need a table in the middle like you have. Glad I could help Jen! Remember to use bed risers to lift your cutting table up to the proper height…it will save you many backaches! I bought the cutting table from JoAn’s with coupon of course. It was sort of flimsy so we bought 4 white chests and put them back to back.,Then took the legs off the cutting and put on top of the chests. Wala a very sturdy perfect height cutting table and 12 new drawers…I was in sewing haven. Hi, just want to say how glad I am I found your site. 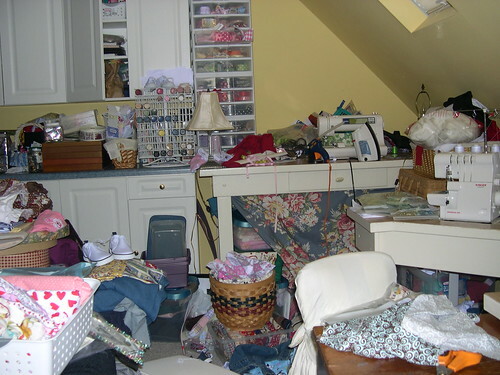 I really need this motivation to get my sewing space cleaned up and organized! It is so bad, I don’t want to go in there. Just so “junked up”, I can’t do anything, find anything…just a real mess. Many thanks for your inspiration and motivation…look out ‘room’ here I come!!! Hello – Marty – any chance you could post a picture of the cutting table you made? I, too, have the Joanns cutting table and would like to put the top on some cabinets or chests. Where did you get yours? Thank you. this is exactly what i need. I am going to post a picture of my before… you guys won’t believe it….. where do we post the pictures? do we have to use the url or can we just post them here? Thanks Pat…glad I could inspire you! Alicia…I’d love to see your before and after pictures. Just post a link to your photo hosting site, blog or website here in the comments. Here’s another idea – has worked out great for me! Buy a full sheet – 4′ x 8′ – of 3/4 inch plywood at the lumber yard. I mounted 6 PVC plumbing flanges on the bottom with Liquid Nails, stuck in PVC pipe cut to the height I wanted, and bought PVC caps for the bottoms. To take it a step further, I padded the top with upholstery batting and covered it (staple gun) with a white percale sheet (bought on sale). The latter is a tighter weave than mustlin – sturdier. Now I can pin my patterns into it, iron on it (great for tablecloths, etc.) and cut out large things like curtains. Love that idea Jane! Although I wouldn’t use it as a cutting surface (I recently purchased several industrial cutting table sections), I think I’d definitely try your suggestion for an ironing surface. My regular ironing board is just not large enough at times. 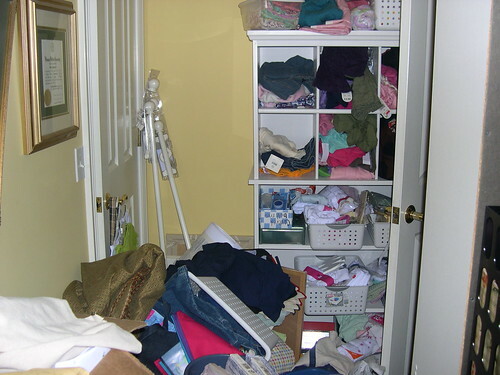 My husband keeps saying I need to go on one of those organization shows, but I’m afraid they’d make me get rid of something… LOL! I actually have a cutting table, however, it’s totally covered with stuff so I usually cut on the floor in the hallway. What I would love is for somebody to come in and do custom cabinetry so I can hide it all way, however, I just can’t justify the expense. I’m going to start this tomorrow – hope I’m not too late. I’m just going to warn everyone … mine is def the messiest. My sewing machine is on the floor right now, bc there is no room on my table bc of all the junk!!!!! I’ve started bringing it out of my room and sewing on my kitchen table. I’ve been wanting to get started on organizing my room and just is just the thing to kick me in the pants. oh my Pam…LOL! Although messy, I think you have an awesome room. You just need to make better use of your storage that you do have. I would start by getting the fabric in order….and then just do baby steps until you get it done. You can do it!!! I’d love to see ongoing progress, so feel free to post more pics! Good luck! discovered your site @ Pattern Rescue. Interested in pattern & fabric exchange sites? Survivor of Hurricane Katrina & had to down-size to much smaller house/sewing room. Recieved Pier 1 craft table with cubbies & stool for xmas so now inspired to redo sewing/craft room. Walls are FILLED with framed vintage fashion prints, also have vintage dress maniquins…as an RN working in the ER i save the glass containers that IM & IV meds are stored in (they come with little rubber stoppers) wash them out with hot soapy water, remove the labels, & use them to store snaps, small vintage buttons, colorful beads, etc…very nice display for a sewing room…can get more if anyone is interested. Okay, I put my before pics on my blog if anyone is daring enough to see them. I myself was a little scared to walk in the room, let alone photograph it. Can I use a photo of an unorganized room for a presentation I am putting together. I work for a sewing machine company. Sue M. – I love the idea of the vintage prints on the walls! Amy…you can do it!!! Any updates? I get the prize! Thats for sure! I would love to send you my photos, but don’t know how to do it. Do I add them here as an attachment? Hi all! I just stumbled across your blog as I was combing the internet for sewing room/studio inspiration. I have a great (not too large ~ not too small) former “formal” living room that my DH has graciously allowed me to redesign as a sewing space. I am TRYING to clear out all the old junk before I finalize my ideas, but I have come across some great inspiration here! Thanks for sharing your photos. I have some before pictures (actually they are DURING pictures when things are all thrown around ~ but that makes the AFTER pictures look SO much more dazzling!!! ) I will post both when I get a little further along in the project! I have a little handbag business that just sort of took over the front living room and I think my precious husband just gave up trying to fight it! Check out my little bags if you get a chance! 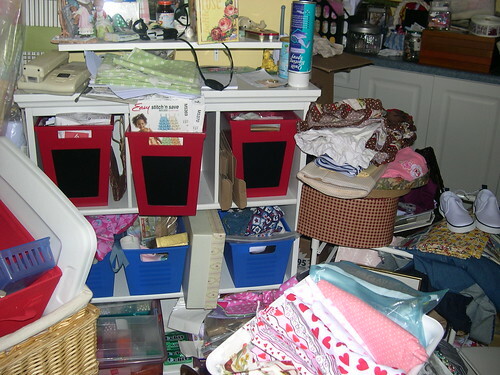 Lisa, I have been reorganizing my sewing room and I am in desperate need of a new cutting table. I have tried building my own but the base cabinets I was looking at, are too expensive, so I need other ideas. Where did you get your industrial cutting tables and I would love to see a picture of them. Lisa, did you know that when you googleimage sewing room pictures this post is the third item up. My sewing room is organized now. YAY. The before and afters are on my blog. OK, those aren’t the REAL before’s, I’d already cleaned it up a bit when I took the before pictures…..but you get the idea. Now I just have to keep it this way. signs to make our area our own. Be creative..name your area. Keeping a workroom organized is not easy. We take 15 minutes every morning before we open and 30 minutes every evening before we close. Sometimes even THAT is not enough. Thank you for creating this site! My teeny sewing room is a giant monster that I’m at a loss as to how to corral! I went to BH&G site for help, but when I saw what they were calling a “sewing room” I just shook my head. Your site has real help for real sewing rooms and the people who use them. I find it especially helpful to see what others are doing for storage in “sewing areas” that are a tight fit. I’d like to know more about your company. Do you offer sewing lessons? What kind of services do you offer? I’m looking foward to producing my own men clothing line. I’d would like to start oft by designing and producing men shirts. I want my daughter to sew, same as my niece!! They love fashion, hate knitting!! Any advice girls? I just found this web site. I would love to have sewing buddies. I work a lot of hours. I recently bought a home that allows me the space to have a sewing studio and I would like to begin a business on the side but not sure where to begin. I will accept any advice. HI all I have a 12 x 12 dining room space in our 2 bedroom apt. I am trying to post pics here but i am having trouble w/it. Anyways my hubby yesterday installed some shelving for me & i am thinking about adding more this weekend on this huge wall in there..i LOVE my space!..i can be in there w/the family & still sew..i also have my scrapbooking stuff in there..he even told me yesterday to go get another 4 or 4 drawer on wheels..lol he said i am gonna need it for my fabric stash!..The whole reason we did this redo is cuz he got me a brand new Singer Serger (a steal @ 216.50 paid 16.50 for layaway) & i should have it in time for my bday next month!. so i needed room for this one machine..i am also thinking about getting a small square table since there is an open area..if i can manage to create this space any1 can!..i LOVE this website & will tell my other sewing friends about this site..thanks so much..
Greetings! I found this site when I was searching for tips on organizing sewing and craft spaces. I moved last year and my sewing room is still in boxes in my basement! I had a large room dedicated to sewing, with a 4′ X 8′ cutting table (2 saw horses and a sheet of 3/4″ MDF), multiple storage shelves, several sets of plastic drawer units, a large sewing table and a 6′ closet bar for storing the stuff I sewed. Unfortunately, I had to move, so it all went in boxes. My new house doesn’t have the same huge sun room that my old one did, but I do have a spare bedroom I am going to use for my sewing room. I originally planned to use the basement but the humidity is a killer down there! Since the move, I haven’t gotten time to set things up, so this challenge is exactly what I need to get me going! thanks Lauren! I linked up! Love all the creative spaces! there was someone asking ‘how’ to build a sewing table? SHORT VERSION: – old (or new) bedroom doors (OR Particle board/MDF sheet framed) on 2 x IKEA ‘EXPEDIT’ bookcases (W149 x D39 x H 91cm) on their side will do the trick! The IKEA shelving is the perfect storage – fabric roles can be pushed all the way through if necessary! Anyway, he attached it to the wall with hinges on the side of his garage (to pull down for use and pack away to put his car in)… and we brought the other half to South western Sydney and it now sits (with 4 legs) on top of 2 Ikea ‘EXPEDIT’ bookcases (W149 x D39 x H 91cm) on their side which arte full of archive style boxes of sorted ‘stuff which needs to be sewn’. Sadly I got disrupted in the middle of re-organising (due to rain getting in through one roller door in my 6x9metre metal shed… (My husband is now getting the ‘wet’ end for his tool storage as they will be off the floor and he uses the space less) and other stuff is EVERYWHERE ELSE! I also have conference ( banquet ) table I use as a cutting table. I keep mine in the closet – open, set up, ready to go. I have a large 2 bi-fold door closet. When I need to cut, I either open the doors and cut on the table that way ( small jobs ) or slide it out into the middle of the room. When I finish, the table goes back into the closet. I still have plenty of room in the closet for other things. Works GREAT for me !! Kerri…I’d love to see photos! I began to put my sewing room together approximately 6 months ago. Since that time, a pipe broke and my sewing room was flooded. I also have other crafts (papercrafts) that I used to do….making cards, altered art….all of the paraphernalia I have from that is in this room also. I do have a cutting table my husband built…elementary, but functional. I painted, bought a peg board, put up a cork board, went through all my patterns, etc….and the rains came again…this time through the laundry room. I am so disgusted now I don’t even want to go down there and begin again. My house is relatively small. It is very wet down there. I tore up a wet carpet and pad and now I have to do it again. I have no motivation to do this again…although I still want to sew. I am pretty disgusted so finding this little jewel on the net can maybe help change my mind and get moving again.